Last week the Metal Thursday/Worcester metal scene family gathered to celebrate the birth of our brother in horns and arms, the one and only Matt Smith. 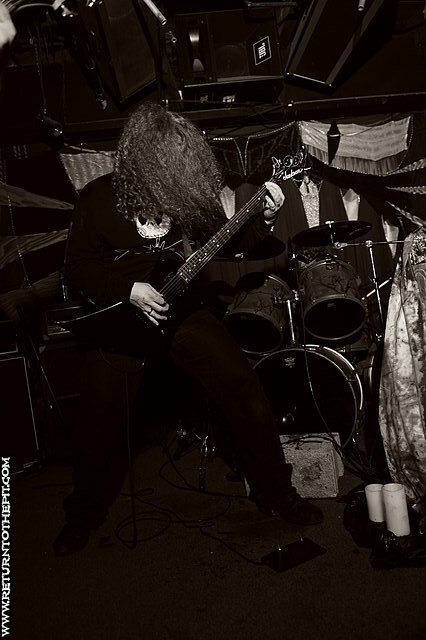 This man has been an active member of the New England metal scene for years, winning our hearts while headbanging his gorgeous golden locks or playing in fuzzy heavy incredible doom bands or just being one of the friendliest and most badass mofos ever. I call him my hair brother for we share the blessing of having blond curly hair that is perfect, but he's also my brother in metal. So in honor of this most metal of men, I share with you the early days of Matt Smith's metal career, a band called Engorged. Not to be confused with the slightly more well known death/grind band from Portland, Oregon, this Engorged was formed around 1992 or so in the Worcester area. Matt and his buddies set out to produce their own brand of brutal and dirty death metal. This brand consisted of chunky brutal riffs, fast skillfully chaotic guitar licks, grind blasting pummeling drums and inhuman gruff grunts. All this plus a gritty satanic atmosphere which provided the final key to their brazen sound. Engorged were definitely a force of death metal nature, releasing a killer 4 song demo in 1993 (which I share one song with you!). Sadly, their brutal time together was short, disbanding around 1995. Fortunately for those of who missed their early run there's a new chapter in the story of Engorged. 2011 saw the return of Engorged from the band. Today they continue to show Worcester and Boston how real old school death metal is done. They sound fresh and new while keeping true to their traditions. It's always to pleasure to see Engorged punish audiences with dirty and raw music, plus they do a fantastic cover of Venom's "In League With Satan." Anyways, happy (belated) birthday Matt Smith! Continue to be the most metal person I know!